“The experience is all-too familiar for many women. An overly aggressive suitor asks for your number. You feel uncomfortable or unsafe, manipulated or just want to end the interaction. 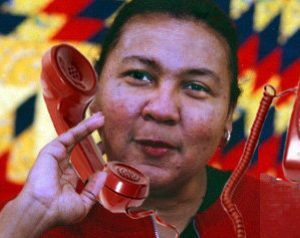 Sometimes, it feels easier to hand over your digits than to reject the person outright; but you don’t want to field unwanted text messages or phone calls. Been there? Over it? Go ahead and memorize this number: (669) 221-6251. 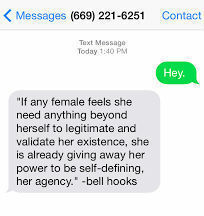 That’s the hotline for the new Feminist Phone Intervention, which automatically replies to calls or text messages from unwelcome admirers with an automatically-generated quote by renowned feminist writer, theorist and professor, bell hooks. For women deflecting pushy guys at the bar, the hotline “protect[s] your privacy while dropping some feminist knowledge.” And its creators acknowledge that unwanted sexual advances sometimes move from irritating to dangerous. They cite, “because we’re raised to know that evasion or rejection can be met with violence” and “because women are still threatened and punished for rejecting advances,” as grim realities necessitating measures of protection, however small. Recently, the fear and intimidation that women experience when they encounter unwanted sexual advances was well documented by the #YesAllWomen Twitter trend. The powerful movement inspired a Tumblr site, When Women Refuse, which chronicles the chilling acts of violence against women who rejected unwanted sexual advances.